We all had lots to do at our first potluck meeting on Monday! Members enjoyed the great food brought in by those of us in the first half (A to K) of the alphabet. Our Membership Co-ordinator Hetty has some mouthwatering photos of the spread on her blog here. Meanwhile, upstairs everyone had the chance to vote on their three favourite children's placemats from the 25 excellent Presidents' Challenge entries that were submitted. Most of us found it difficult to only choose three! Watch for a separate post in the next day or so with the details on the winning entries and a complete set of photos. The next Bee Night on January 14, 2013 is already full, but you may contact Janet or Terry if you would like to be added to the waiting list. 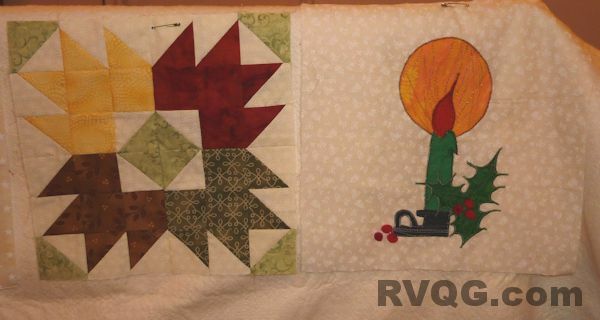 The project in January will be a joint effort with Quilts from the Heart, and members will make either a disappearing nine patch quilt from 5" squares, or one of the Quilts from the Heart kits from Carole. 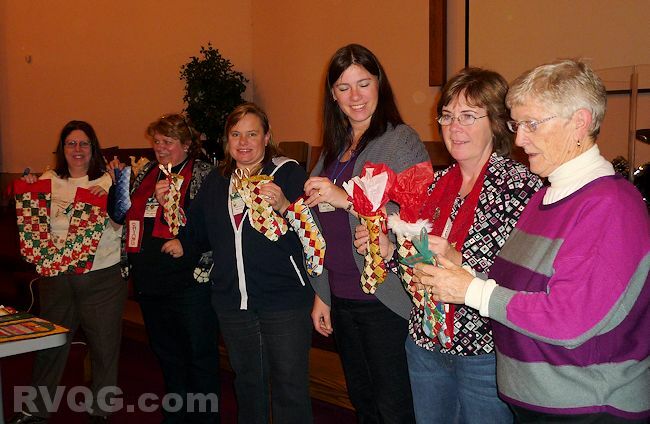 Either way, the quilts will go to one of our regular Quilts from the Heart charities. 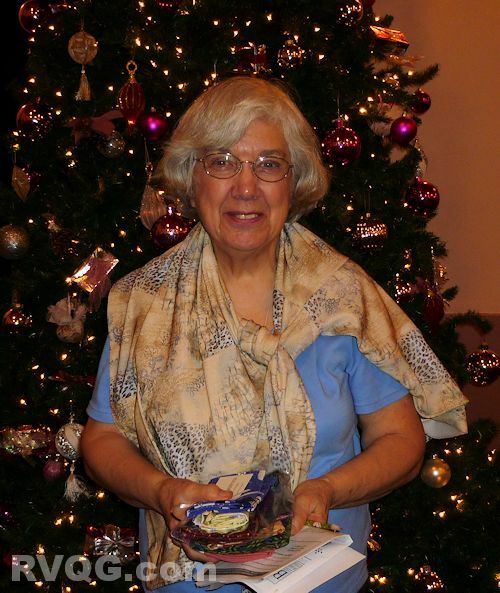 Ingrid is now taking sign ups for our retreat at Elim Lodge next fall, 2013. 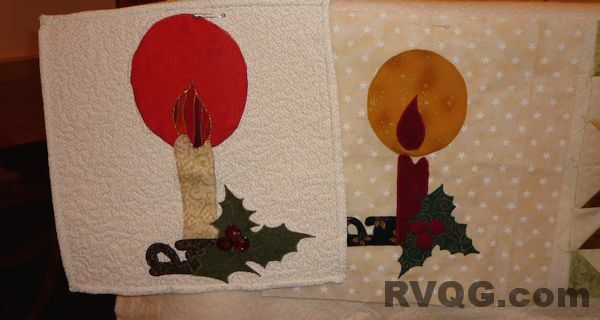 More information will be added to the website at the end of next week, but in the meantime you can email us at rvqginfo@gmail.com for more information. 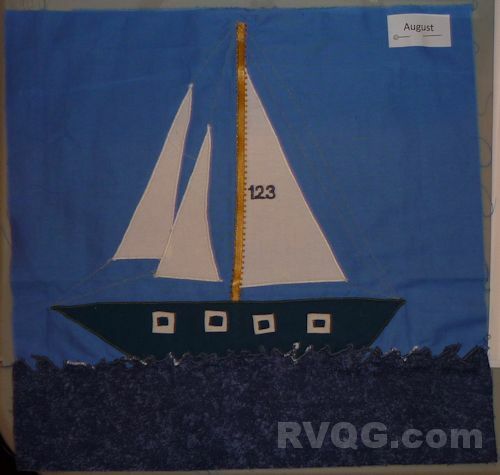 This month's Block of the Month is a sailboat, representing the month of August in our Calendar quilt. If you missed your copy of the paper pattern, you can download it from our Block of the Month page, along with all the previous blocks. Several members brought in projects for Show & Tell, and those photos will be posted next week. For now, I will leave you with some of the Blocks of the Month from earlier in the year that were brought in for display. 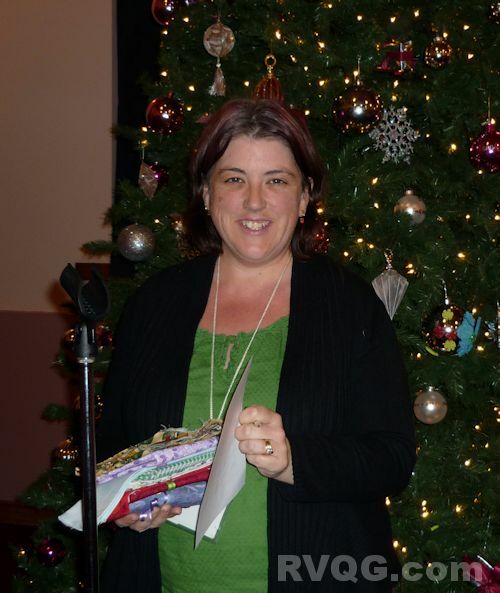 Happy sewing everyone, and have a great holiday season!